Not all comic book events are created equal. Valiant has an ambitious and mostly satisfying event in "4001 A.D." It examines Valiant's long line of heroes reimagined for the future and how their legacy lives on and why. The '4001 A.D.: War Mother' is another one-shot but it's far from average. In the Grove, only one person scavenges outside of it for what their secluded community needs. When a piece of technology crash lands from space it's up to only the "War Mother" Ana to gather the things they need but bring back "nothing living." Armed with only her smart weapon, installed with a type of artificial intelligence she calls Flaco, she sets out to salvage what she can but only comes across more trouble than she bargained for. 'War Mother' helps to expand the Valiant universe with this essentially small story that explores a diverse population of survivors in the future but is not presented as a dreary dystopia. Fred Van Lente creates not just a strong female character but she's also a mother, a wife, a leader, whose integrity and empathy is rock-solid. Flaco isn't your typical A.I. device, it's not quite HAL 9000 but more like Siri with a moral compass. It's rebooted and memory wiped before each mission and it learns things as it goes. It made for some interesting discussions and raised some serious questions that gave this adventure some added depth. Tomas Giorello’s art is exceptional and well laid-out. For all its parallels to Furiosa of Mad Max: Fury Road, Giorello avoids creating a dark world of the future. It's futuristic enough while feeling tribal and communal still. The action is fluid and cinematic using quick close-ups and surprises that heighten the tension. Brian Reber’s colors are mostly muted and occasionally bright. He's responsible for keeping this world sunny and habitable, the antithesis of Blade Runner. It's an engaging setting that would great to explore further if 'War Mother' gets another one-shot or limited series. Valiant has made an impressive pilot issue for Ana as the War Mother. It has the potential to become a flagship title if given the chance. 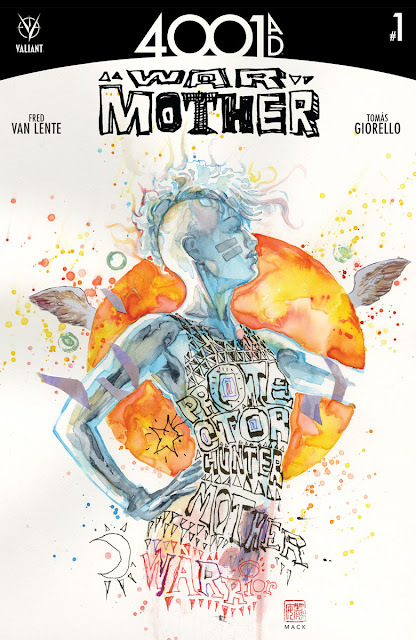 As an engaging and exciting one-shot, 'War Mother' is definitely a must-buy. We have our fingers crossed that we'll see Ana again.